‘Muscle memory’ is an unconscious process. It is the movement which muscles become accustomed to over time. With practice, skeletal muscle activity that is learned can become essentially automatic due to the neuromuscular system memorising the motor skills. Babies are not born with muscle memory. They are not born with the ability to crawl or walk. As a child becomes skilled at walking they fall down less, become better at balancing and are then able to incorporate more coordinated activities such as running and jumping. Therefore, the only way for a baby to learn muscle memory is to physically practice with trial and error. We want infants and young children to perform their learned aquatic survival skills instinctively and automatically when needed. 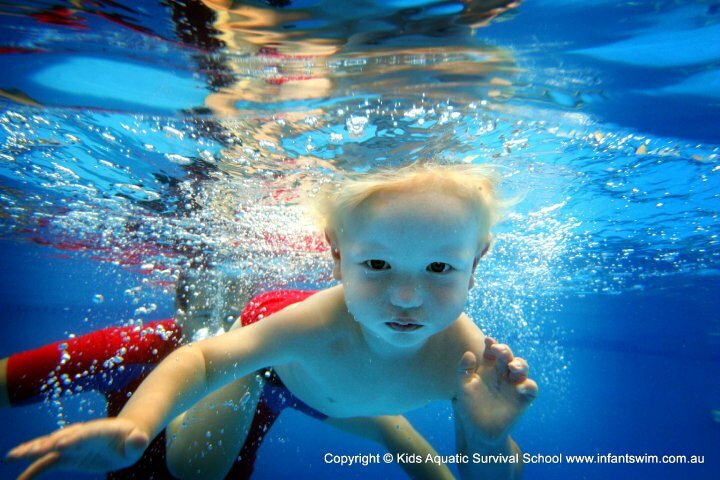 At KASS, we encourage correct form from the beginning of a child’s survival and learn to swim experience. If you don’t use correct form at the start you can enhance bad habits. For example, an older child who had been previously taught to swim in a vertical position lifting their head to breathe would be considered a bad habit. Such bad habits can seriously disrupt and damage the associated muscle memory and can take time to break. However, with conscious effort it can be successfully overridden. KASS place emphasis on the new skill that is to replace the previous habit until the new muscle memory pattern is established. This is why the KASS survival and learn to swim program is taught 5 days a week for at least 40 x 10 minute lessons. It takes strong concentration by the instructor and consistency from the child to change current muscle memory. 1. Cognitive Stage: The cognitive stage begins when the learner is first introduced to the motor task. 2. Associative Stage: The associative stage is where the practice of the skill begins. 3. Autonomous Stage: The autonomous stage is characterised by executing the skill automatically with no conscious thought. Once actions are memorised by the brain, the muscles must be trained to act in a quick, fluid manner; (Mack, 2012). This is key because it lowers the time between when the brain decides to complete a movement to when the muscles actually start to move. From our experience in teaching children the KASS survival and learn to swim program, children can develop this muscle memory in weeks with consistency and commitment. Our ultimate goal is from the program, is for the child to apply their skill as an automated process and instinctively orientate themselves in water, to roll into a back float, rest, breathe and be safe. Ellis-Christensen, T. (2012). What is Muscle Memory. Available: http://www.wisegeek.org/what-is-muscle-memory.htm. Last accessed 2nd Dec 2012. Mack, S. (2012). Does Muscle Memory Affect The Percentage in Basketball? Available: http://www.livestrong.com/article/448564-muscle-memory-affect-percentage-basketball/#ixzz26i9yQVFS. Last accessed 2nd Dec 2012. Morley, K. (2012). Muscle Memory. Available: http://sportsnscience.utah.edu/musclememory/. Last accessed 2nd Dec 2012. Shadmehr, R and Brashers-Krug, T. (1997). Functional Stages in the Formation of Human Long-Term Motor Memory. The Journal of Neuroscience. 17 (1), p409-419.